My twins are officially here! Even though my family has changed drastically in the last few days, our home has not as we have decided that this was not the right time to move out of our small condo. 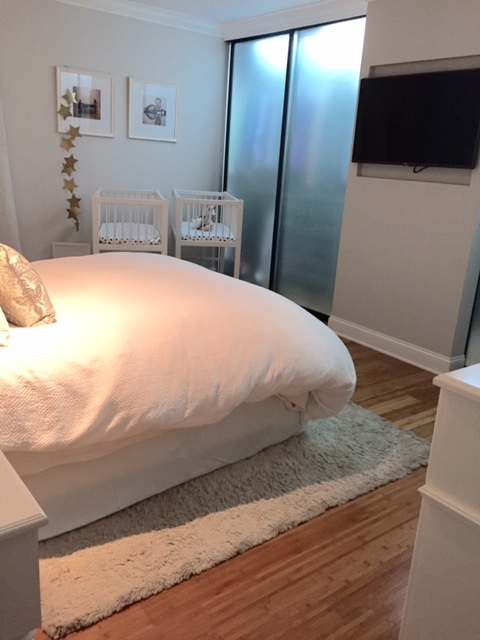 It was important to my husband Scott and I that we prepare our space for the girls’ arrival making any changes necessary without compromising our own comfort (especially since they will be sharing our room with us at least for a little while). We added a second changing station to our home as with three under three we see a lot of diapers in our future. 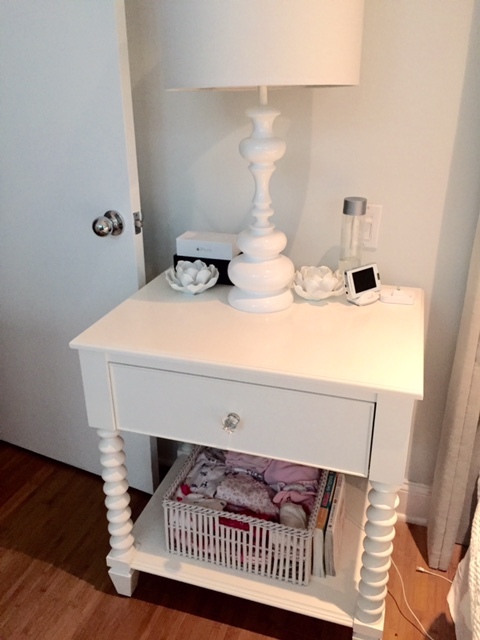 Our existing dresser was the perfect spot for this, and all it took was a contoured changing pad, a simple cover, and a big basket full of all the essentials. I hung the gold stars from our “Sprinkle” for a touch of whimsy. I added another of the same Reed Between the Large Changer Basket to the bottom of my nightstand and filled it with all of their tiny clothes (which I will change out as they grow). The items on top of my nightstand stayed relatively the same with just a few feminine accessory changes, and it’s just the right place for our double monitor. Perfect for spying on the babies and their big sis! Scott and I decided to get ourselves a gift too! Brand new bedding from West Elm helps us to sleep better at night (or at least we hope it will soon). By far my favorite new addition to our room (besides my two precious girls) are these bassinets that my dad made for them. He is so talented and nailed my vision! 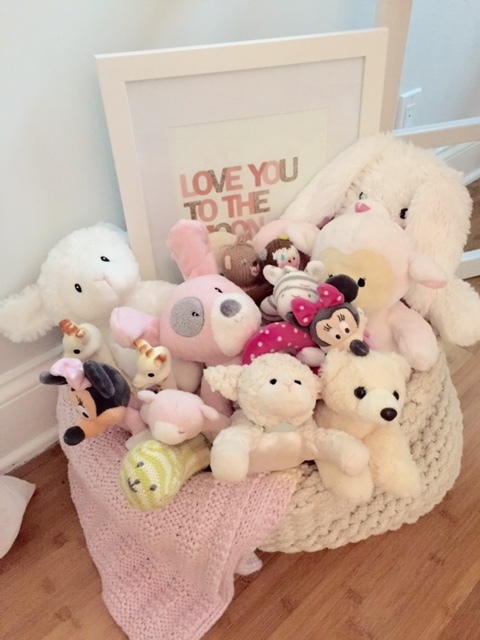 … and filled a basket with all of their dolls and rattles and this adorable print from my own twin sis. I absolutely love how our room turned out. It functions well for all four of us, and I know that it will be a great space to enjoy until we do decide to make a move. A special thanks to all of our friends, family, and followers for the outpouring of love you’ve shown our family this week via social media and on our blog! We promise to keep you updated on these adorable girls journey and all of the fun design details we do for them along the way! 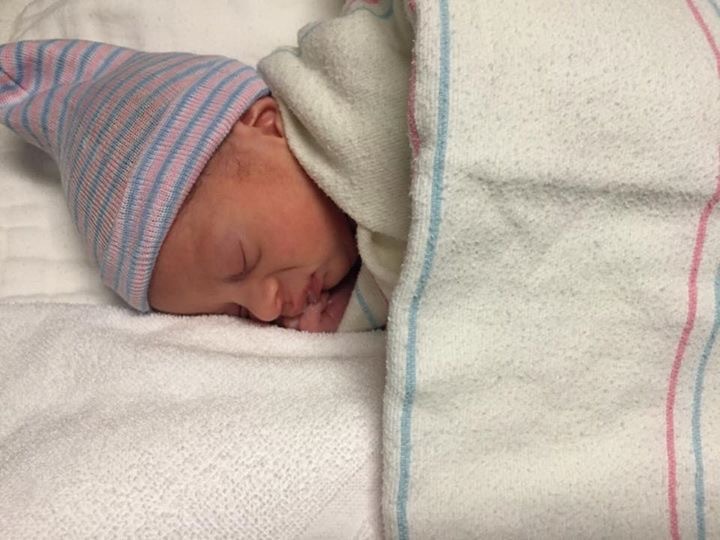 I am super excited to announce that Lauren and Scott had identical twin girls on Tuesday, February 23rd! 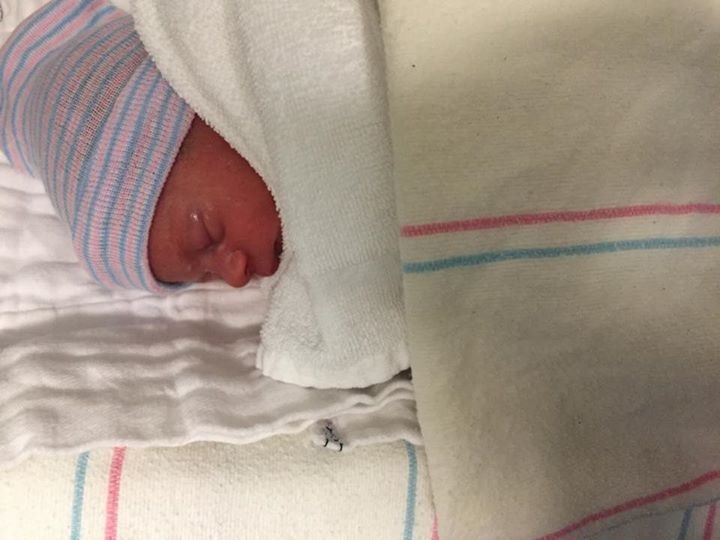 Cara Emery was born at 4:18 pm and weighed in at 4 pounds and 14 ounces. She is being taken care of very well in the NICU with the promise of coming home over the weekend. Cara was born with a head full of fuzzy dark hair, the trace of two dimples when she smiles, and a very sweet demeanor. Sienna Jade was born at 4:21 pm and weighed in at 4 pounds and 13 ounces. Lauren is already getting to know this little girl’s spunky personality very well and loved getting to introduce her to her oldest daughter, Ava. Sienna is happy and healthy and loves to move. In fact, she kept Lauren up the night before she was born “swimming around”. Lauren and Scott are already completely in love with both of these new additions to their family and so is their “Aunt Tams”! May Cara Emery grow to live up to the three beautiful (inside and out) women that she is named for; Grandma Charlotte and Great Grandmothers Etti and Mary. Their sweet nature have already rubbed off on this little girl! May Sienna Jade always stand up for what she believes in and carry a zest for life just like the thee amazing women she is named for; Booba Shirley and Aunts Julie and Judy. Both girls are such a blessing! 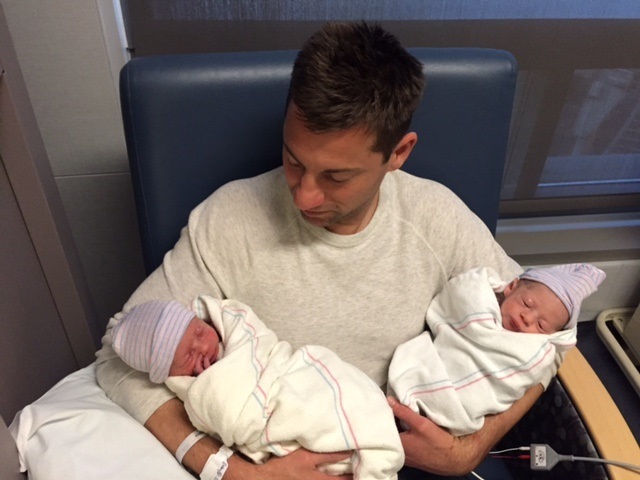 Congratulations to Scott and Lauren on their new bundles of joy! During my second pregnancy (which is soon coming to an end), I have definitely allowed myself to eat what I and the babies want but have also tried to keep a balance between our wants and the nutrients that we need. I have been trying my best to make healthy choices without sacrificing too much in the taste department. This past weekend, for Valentine’s Day, I prepared a little brunch picnic for my husband, my daughter, and myself. I decided to make a healthier version of the blueberry muffin recipe we are all used to as we already had so many other sweets in this meal. They were delicious! 1. Preaheat oven to 350 and coat muffin tin with cooking spray. 2. Mix together 2 cups all purpose flour, 2/3 cup sugar, 1 teaspoon baking powder, 1 teaspoon baking soda, 1 cup quick or regular oats, and 1/2 teaspoon of salt in a bowl. * I used whole wheat flour instead of all purpose as it is a healthier option. 3. In a second bowl, mix together 1 1/2 cups honey nonfat Greek yogurt, 2 large eggs, 4 tablespoons unsalted butter (melted and slightly cooled), and 1 teaspoon vanilla extract. 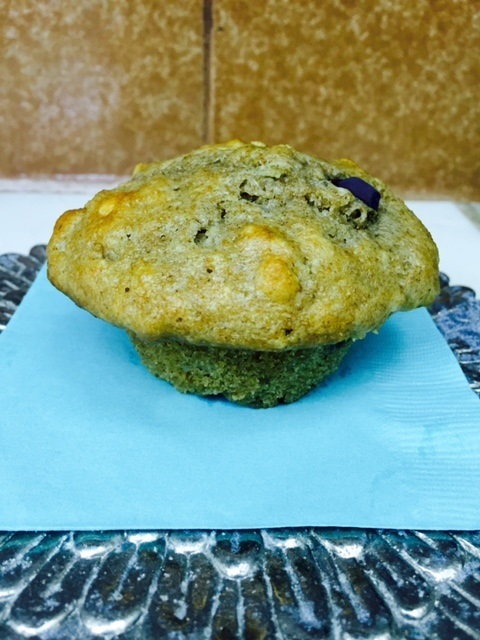 * Blueberry muffins are traditionally made without oats and yogurt which makes for a much less healthy option. 4. Add the dry bowl to the yogurt bowl and mix well with 1 cup bluberries. 5. Fill the muffin tin completely and bake until golden on top (20 – 25 minutes). I hope you have enjoyed this new edition of our weekly Food Fridays series. Sharing recipes helps us to constantly be looking for new things to make at home, even if it is not always easy to eat healthy. Do you have a favorite healthier option to share? We would love to hear from you. Leave a comment below and share your homemade recipe or favorite Pinterest pick! 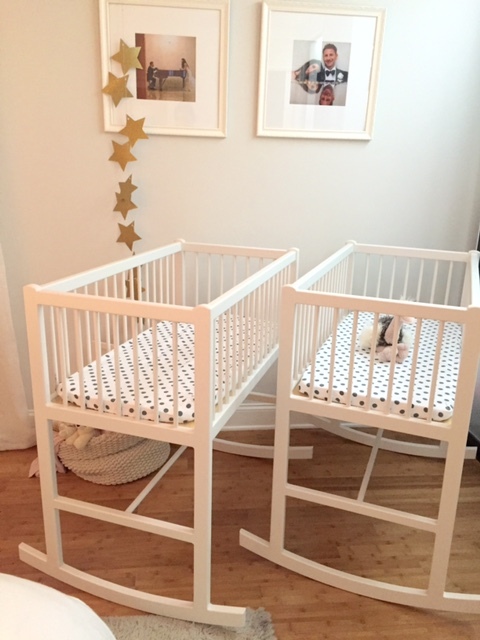 Leading up to the birth date of Lauren and Scott’s twins, we have shared some insight (in our previous posts Guest Blogger: Mom of Twins and Registering for Twins) for how to prepare for such a big event. 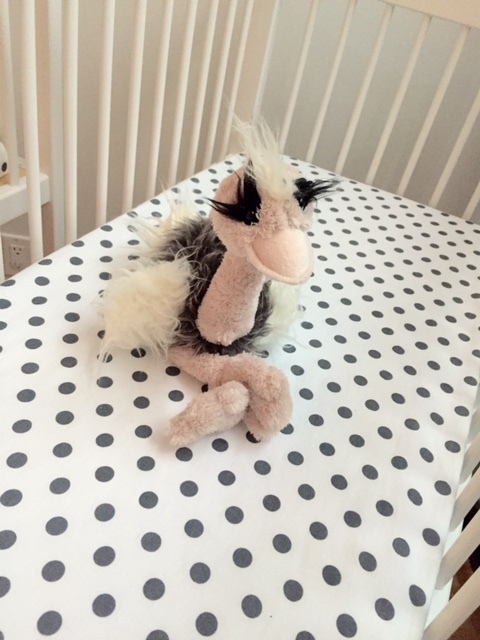 Lauren has been working hard to organize her space and to get ready for the new additions to the family and once again turned to an expert on this topic for their words of advice. When expecting a baby many new moms quickly learn that there are many little things that come along with your little one: bunches of books, an overflow of toys, tons of tiny clothing, and not to mention countless diapers. All these items can be overwhelming to organize and keep on hand at a moment’s notice! 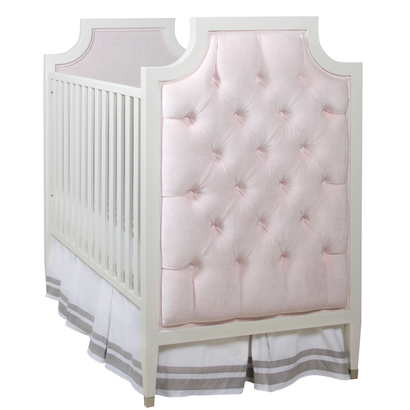 Below we cover some helpful tips, especially when picking furniture, to keep your nursery organized and beautiful! 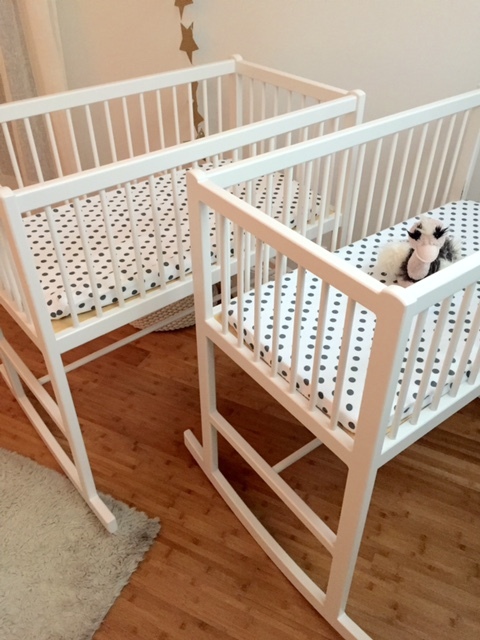 When choosing a crib you might be thinking all about the aesthetics, which is of course the number one thing to consider, but, if you are also being conscious of organization then try picking a crib with a bed skirt. Why? For storage underneath! Baby Cribs with a bed skirt will allow you to slide a drawer underneath where you can keep certain items especially handy for when your baby is up late night. 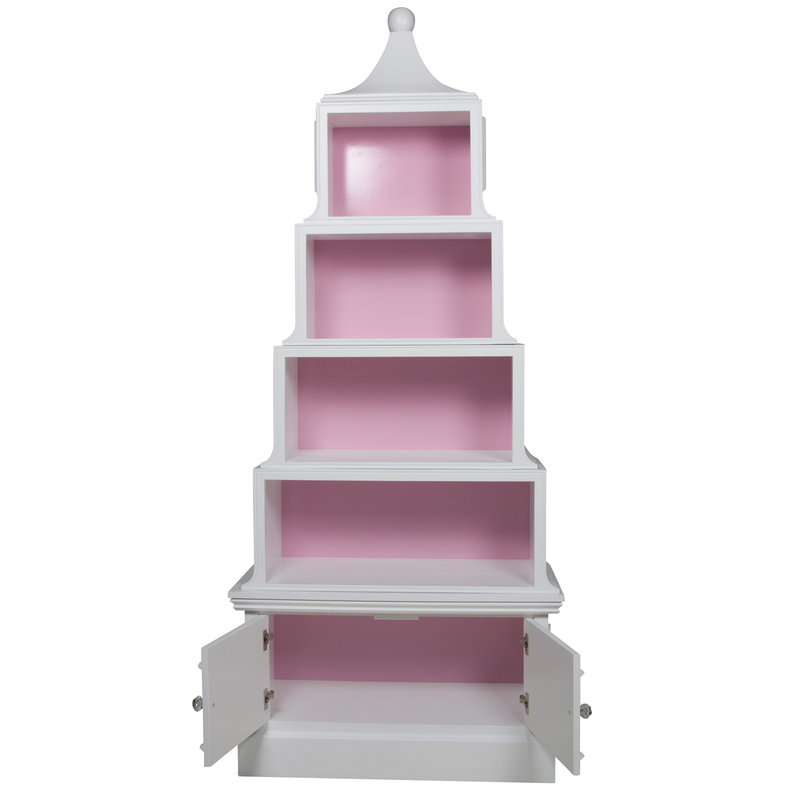 Instead of opting for a dresser or a large cupboard / wardrobe, go for bookcase style open shelving. While this may not keep your items as concealed, it will allow for easy access and fast organization. When you can see where things are or where they belong, it will be easier for you when you need them. If you want to go a step further, buy those shelf organizers with labels on them to keep items separate. Functionality is a great idea when it comes to nurseries. 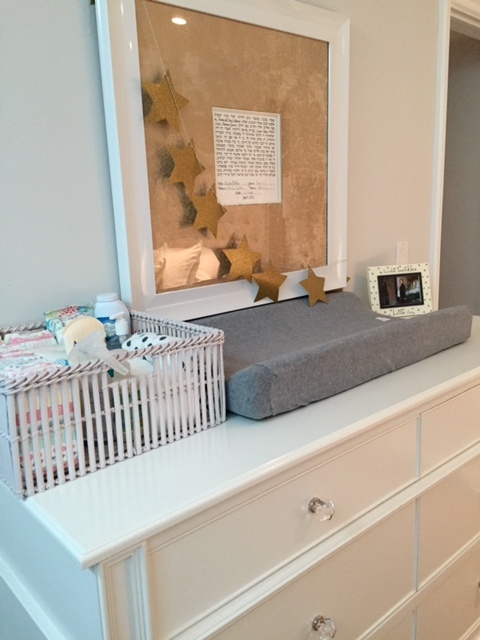 When choosing your furniture consider items that save time and place like a dresser with a changing table on top. This will give you extra storage in addition to conveniently located items needed when changing your baby! Another great furniture option is dressers and bookcases with pull out platforms, very handy when you need an additional square foot of surface space. Organizing your nursery can seem like an intimidating task, but employ some of these tips, or use the concepts presented here to create your own shortcuts, and you will have a beautifully decorated and effortlessly organized nursery in a flash! 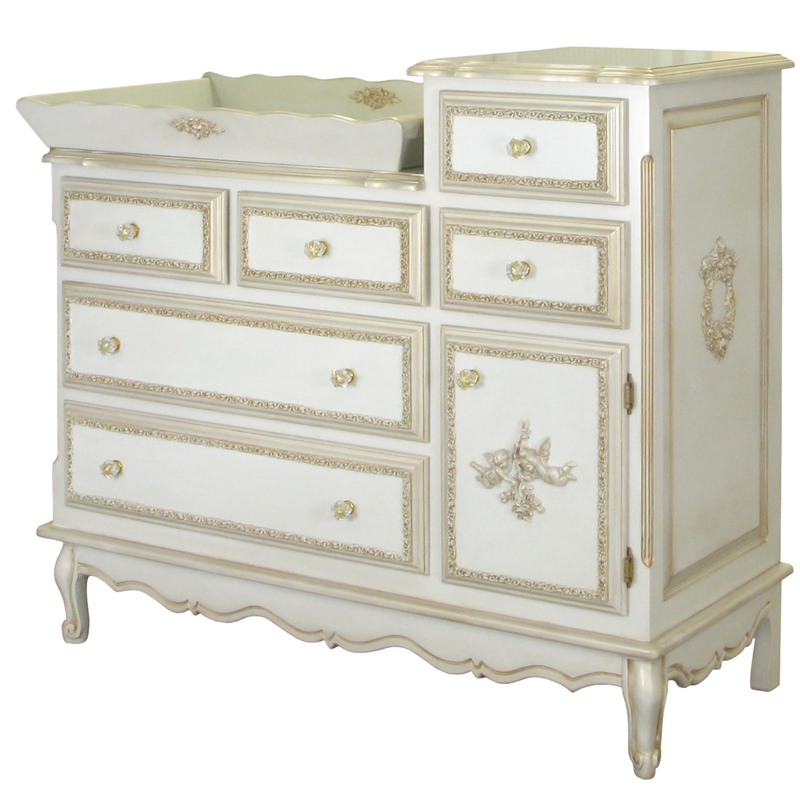 Visit AFK Furniture to find some of the amazing luxury baby furniture pieces mentioned above and start planning your dream nursery now! Last week, Tami posted about the beautiful sprinkle she was involved in planning for me, but little did she know at the time, that I was doing a little planning of my own. I prepared some thank you gifts and handmade tags to show my appreciation for all of the girls who contributed their time to putting together this special day. Great minds really do think alike … it turned out that the color scheme of the party was the exact same look I went for in my own project, and I just might have had a little tip that there was a star theme involved (wink). I guess Tami and I really are twins after all! I went to one of my favorite spots, Paper Source, and stocked up on almost everything I needed to complete these gifts. 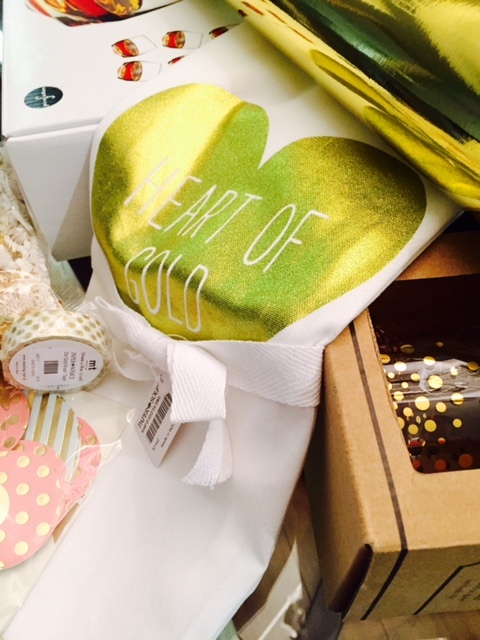 For the two main hostesses, Tami and my Mother-in-Law, I hand picked bar glasses that fit the style of their home and that I knew they’d love and an adorable gold heart dishtowel perfect for this time of year. For the others who helped, I wrapped little trinkets that I thought were fun. 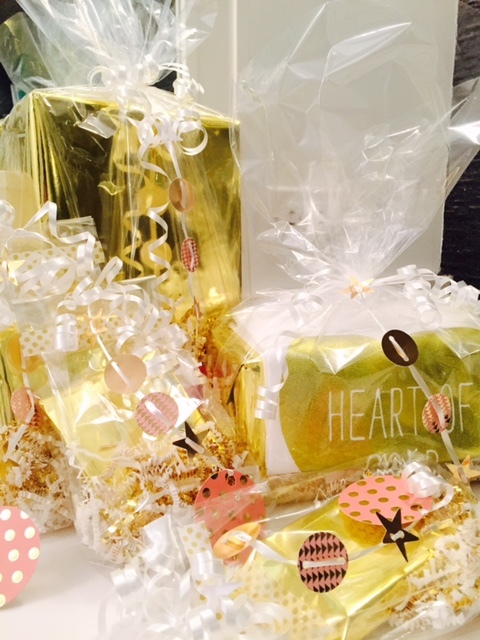 I wrapped each one in gold wrapping paper and placed them inside a clear gift bag with some white and gold stuffing for an extra special touch. 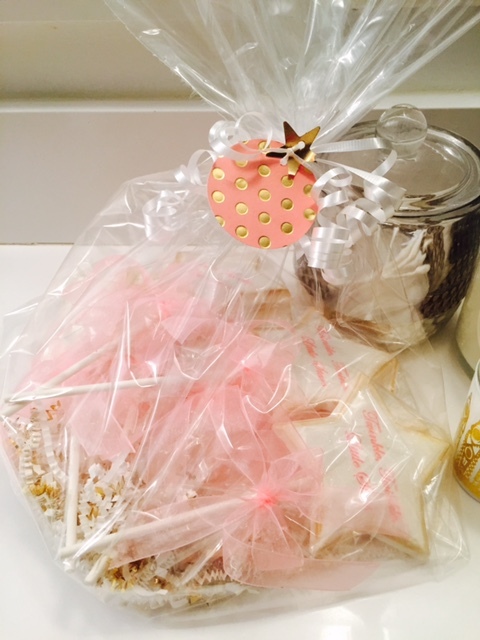 I tied them all off with a little ribbon and some fun patterned shapes with a tag and a personalized note at the end for each one. I am so lucky to have a great group of mommy friends from Ava’s school who wanted to take me out for brunch to celebrate. 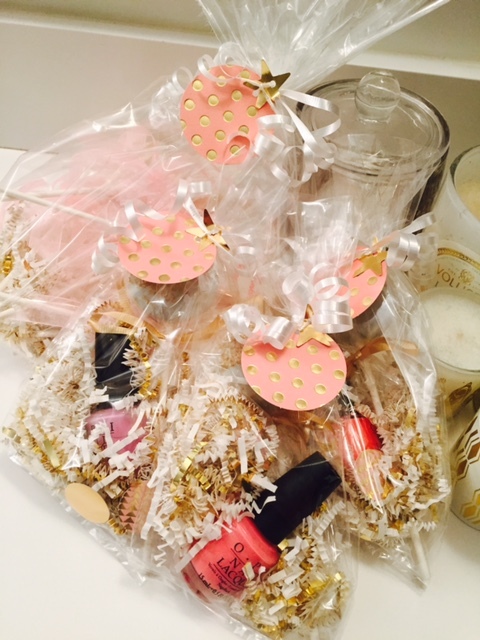 I wanted to give them a little something in return as well and prepared these little bags complete with nail polishes in different shades of pink, an Oreo pop, and a special tag to let them know how much I care. 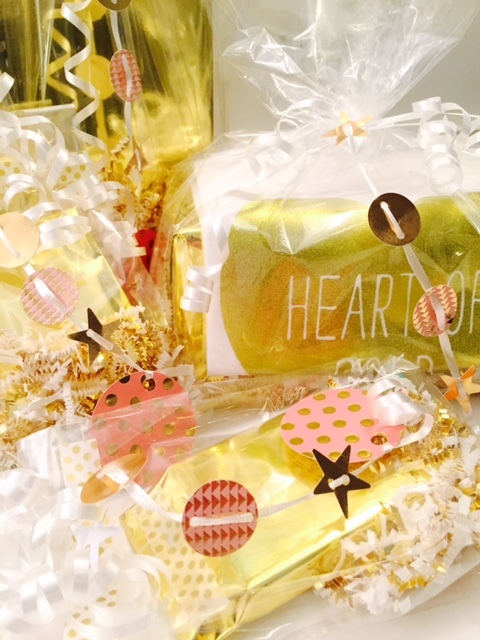 Last but not least, it’s always good to bring a special treat for the nurses and staff at the hospital. 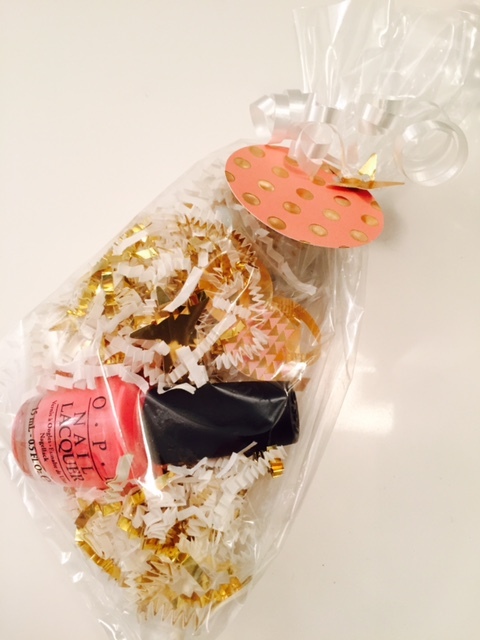 I have this gift ready to go in my already prepared hospital bag, and it was a great way to use up the extra party favors from my sprinkle.